Mr. Bangs obtained his doctorate at the Rijksuniversiteit, Leiden, in 1976. He is a former Chief Curator of the Plimoth Plantation, Plymouth, MA. “And that’s all it needs to be”? I disagree. I think that a historian approaching the question of Thanksgiving Day in the “ever changing Now” will need to ask “the wrong question” – what of all this is true? Surveying more than two hundred websites that “correct” our assumptions about Thanksgiving, it’s possible to sort them into groups and themes, especially since Internet sites often parrot each other. Very few present anything like the myths that most claim to combat. Almost all the corrections are themselves incorrect or banal. With heavy self-importance and pathetic political posturing, they demonstrate quite unsurprisingly that what was once taught in grade school lacked scope, subtlety, and minority insight. Many sites point out that only Edward Winslow’s brief account records Plymouth Colony’s 1621 harvest festivities, beyond which we have just William Bradford’s seasonal comment that the Pilgrims ate turkey among other things. See, for example, Pilgrim Hall Museum’s website. Archaeologist James Deetz made much of the fact that Winslow did not name the turkeys Bradford mentioned. This startling revelation (that in this case one should ignore Bradford’s general comments and suppose that Winslow was providing a complete menu listing) recurs in various websites, such as the 2002 article posted by the Christian Science Monitor. I’ve discussed this oversimplification previously in an article. Deetz’s assertion that there was no thanksgiving in 1621 is repeated at numerous websites. Often authors explain that what took place was so unlike later Puritan thanksgivings that it couldn’t have been a true thanksgiving, usually citing, for the definition of what that would have been, William DeLoss Love, The Fast and Thanksgiving Days of New England (Boston, New York: Houghton and Mifflin, 1895), a book whose title alone seems to have inspired the common web article notion that in New England people fasted as an expression of thanksgiving. 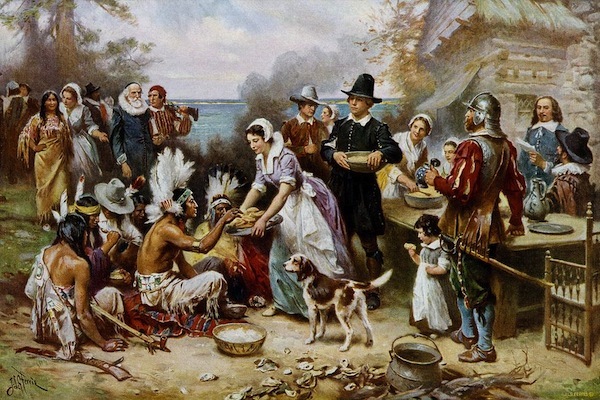 (1) that Thanksgivings were not limited to November does not mean that the first one held by the colonists in Plymouth (presumably in September or early October) was not a thanksgiving. (3) That “what we think of as Thanksgiving was really a harvest festival” (as if that meant it could not have been a thanksgiving) repeats Deetz’s incorrect opinion that an English harvest festival was non-religious or even irreligious. (5) The Pilgrims attempted to pattern their religious activities according to biblical precedent. The precedent for a harvest festival was the Feast of Tabernacles, Sukkoth (Deut. 16: 13-14), lasting seven days. The biblical injunction to include the "stranger" probably accounts for the Pilgrims' inviting their Native neighbors to rejoice with them. Besides Sukkoth, the Pilgrims’ experience of a Reformed Protestant thanksgiving every year in Leiden probably contributed to what they considered appropriate. The October 3 festivities commemorated the lifting of the Siege of Leiden in 1574, when half the town had died (an obvious parallel with the experience of the Pilgrims in the winter of 1620-21). Leiden’s ten-day festivity began with a religious service of thanksgiving and prayer, followed by meals, military exercises, games, and a free fair. The common assumption that the Pilgrims’ 1621 event should be judged against the forms taken by later Puritan thanksgivings - whether or not those are even correctly understood - overlooks the circumstance that the Pilgrims did not have those precedents when they attempted something new, intentionally based not on old English tradition but on biblical and Reformed example. If Thanksgiving was not about the discovery of private property’s profitability, not about help offered to the colonists by the Wampanoag Indians, not about God’s providence -- what was it? Newell, who is described in one site as having degrees from two universities (wow! Fancy that! ), was convinced about the solidity of his research: “"My research is authentic because it is documentary," Newell said. "You can't get anything more accurate than that because it is first hand. It is not hearsay." What’s not authentic is the claim that William Newell was head of the anthropology department at the University of Connecticut, whose faculty cannot recall him at all. When the department was founded in 1971, Newell was 79 years old. See the letter by department chair Jocelyn Linnekin here. And what is completely untrue is the idea that the Pilgrims of Plymouth Colony participated in the 1637 Pequot massacre. Although asked to send military assistance, the Plymouth court did not respond until two weeks after the slaughter had been carried out. See my book, Pilgrim Edward Winslow: New England’s First International Diplomat (Boston: NEHGS, 2004), pp. 164-168. Is this important? Or is the lie “true to its purposes”? Did the Pilgrims rob Indian graves? Not really. As Winslow said, “ because we deemed them graves, we put in the bow again and made it up as it was, and left the rest untouched, because we thought it would be odious unto them to ransack their sepulchres.” There’s more to the story. One could go on. Someone should go on. To respond to all the assorted internet nonsense about Thanksgiving it is necessary to go on and on. I have, here. Mr. Bangs' comments from way back in '05 (which I just stumbled upon this Thanksgiving Day 2010) seem well presented and well said. I have no idea what the "agenda" may be behind the author's words. A call for unemotional debate or discussion of the "facts" seems to cover it, however. I have always been skeptical of the glorious rhetoric so often heard in praise of the Puritans (or Friends, or whatever they called themselves), because I have never felt we as a nation needed to do so. The holiday itself was instituted in the latter 1800's, or so I have read, and as a union of states who had survived all manner of discordant events - some of them self-inflicted - it made sense then, as it does today, to set aside a day to ponder our history and fortunes, and then sit down to stuff ourselves. I would personally prefer it if we didn't have to keep bringing up these ornery malcontents who landed here to establish their own exclusive (literally) society, and ascribe all manner of noble and self-determining motives to them, but that's the history of own history, and in the end, most of us try to just have a day together and get along as best we can. I mean, what does buying a mattress or watching The Saints on TV have to do with Thanksgiving anyway? The good news is that I am free to read and absorb all the truth available and conclude, in the end, that one single story or POV doesn't quite cover everything. Maybe we should have a few American Natives join us for dinner every year, and hey, that's not a bad idea. But today I'll just chill and enjoy the dinner my wife's cooking downstairs. It'll be great. Cheers to us all. Revealing the grand narrative of colonialism appears to sting those who make their living supporting it. The article headline is not supported in the analysis. Not many of the 'debunkers' he's talking about, say that the colonial force that massacred approx. 700 men, women and children of the Pequot Nation was from one specific particular colony. The gloating Governor proclaiming an annual day of celebration and thanksgiving for an act of genocide was from the Massachusetts Bay Colony. Myself and many people indigenous to Turtle Island really do not care about the European squabling about secular/non-secular, pilgrim/puritan/protestant or any other biblical reference inaccuracy. That fact that genocide was justified and encouraged by Euro-christians is enough. The majority of Bangs clarifications are simply designating the difference between the SS and the Gestapo, to use a more recent genocide as reference. And, Bangs seems to think that by disproving claims of 'initial' grave robbing by pilgrims, he is disproving the introduction of sexism, racism, homophobia, jails, social class system, and the murderous genocidal tendencies of early colonials. It doesn't. “To ask whether this is true is to ask the wrong question. It’s true to its purposes. … And that’s all it needs to be. For these holidays say much less about who we really were in some specific Then, than about who we want to be in an ever changing Now." "And that’s all it needs to be”? I disagree. I think that a historian approaching the question of Thanksgiving Day in the “ever changing Now” will need to ask “the wrong question” – what of all this is true?" Truth is relative. Bangs' acculturation as a historian, classically trained in the European tradition means that he thinks he can discover the truth of the Then, if he is diligent enough. But what he will accept as truth will be different than someone else who may be trained differently and is just as dilligent. "Almost all the corrections are themselves incorrect or banal. With heavy self-importance and pathetic political posturing, they demonstrate quite unsurprisingly that what was once taught in grade school lacked scope, subtlety, and minority insight." 1) I could find 10,000 Internet references by christians and muslims alike, that are likely incorrect. It's the Internet for heaven sake. 2) That he uses terms like "banal" and "pathetic" reveal his own self-importance and his position within a specific ideology. What is taught today, not "once taught," in all formal education, not just grade school, on this topic, does "lack scope, subtlety, and minority insight." Now if this comes "unsurprisingly" to Bangs, then why does he banter about the differences between the colony's? Why doesn't he add some scope and minority insight into the myths being taught as history? Maybe add some stories that have previously failed to the meet the colonial project that continues to teach that the transplanted European civilization is the pinnacle of humanity. He knows it is not, but he choses to participate in the erasure of knowledge that doesn't fit the colonial project standard. To call other perspectives as being "heavy with self-importance and pathetic political posturing" is an excellent grasp of the extremely obvious. He is only able to publish this on the Internet, because no academic publication would allow such an opinion piece that is ladden with his own "self-importance and pathetic political posturing." That is not calling the kettle black. It is what it is. What in the world did he expect to find by surveying 200 or more Internet sites? Truth? His truth is already revealed. My response supports the revelation of other peoples truths. Yup, it's a political project. The article on the debunkers of Thanksgiving myths is completely wrong. The writer might have a Doctorate but his arguments are not based on fact (he gives very few in his piece) and we must remember he worked for THE organization that has purposefully spread lies about the history of Thanksgiving. Many go their whole life believing in fairytales that the rest of the world find horrific. The truth will set us all free. Then and only then can we move forward as a whole nation and be respected throughout the world. Nice job at trying to discredit A dead college professor who did the academic research needed to set the record straight. Had you done a little more research you would have discovered professor Newell was in fact well learned, and a faculty member at at several prestigious schools including U of Florida, U of Maine, U Penn, and U of Tampa. Newell was also a recognized expert in U.S. Indian relations, giving testimony to the U.S. congress in the early 1970's. I believe William Newell's accounting to be the most true and accurate accounting of the facts. Peraps before you try to discredit someone you shoud do a little more research. I agree with Dr. Bangs that there is a great assortment of nonsensical interpretations regarding the Pilgrim thanksgiving celebration of 1621. I believe it is useful to review the documentary sources from that time. Thomas Wilson’s A Christian Dictionarie was first published in 1612 so it is possible that the Pilgrims read it in Leiden and carried it onboard the Mayflower in 1620. Research into what the Pilgrims themselves were taught and read can, perhaps, shed some light on their intentions. It is likely that they fulfilled their perceived Christian duty by offering thanksgiving and praise to God for their harvest. Many of them were probably glad, joyful, and cheerful to be able to survive on the fruits of their harvest.